This episode of Teachers Teaching Teachers , was recorded during a live webcast back in the middle of February. 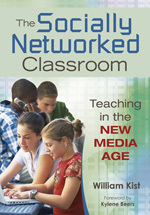 We think you will enjoy this conversation with William Kist and Mike Slowlinski , one of the teachers who is featured in William Kist's new book, The Socially Networked Classroom: Teaching in the New Media Age . Troy Hicks has a thought-provoking question to ask toward the end of this podcast as well. Get the book, and learn along with all of us. William Kist is an associate professor at Kent State University, where he teaches undergraduate and graduate courses focused on adolescent literacy. He has been a middle school and high school English teacher; a Language Arts and Social Studies curriculum coordinator; and a consultant and trainer for school districts across the United States. Kist has over 30 national and international conference presentations and 10 published articles to his credit, including his book The Socially Networked Classroom: Teaching in the New Media Age  (2010, Corwin Press.). In addition to his work in education, Kist has worked as a video/film producer and musician. Kist is editing one independent feature film, Summer’s Journey, and is developing his original screenplay, Field Trip, to be filmed as an independent feature in 2008. This podcast is another in a series of Teachers Teaching Teachers shows to feature the authors of a recent outcrop of books on new media and literacy (Using Technology to Improve Adolescent Writing: 186 . Copyright Clarity: 184 , 135 , The Digital Writing Workshop: 172 , 171 , 170 , Teaching the New Writing: 157 , 156 , 155 , Teaching Writing Using Blogs, Wikis, and other Digital Tools: 138 ) Perhaps we have the makings of a new discipline here, or at least a budding new branch on the tree of academic inquiry. See the National Writing Project's list at Teaching Now: Digital Writing Books . What would you add to this list? Let us know by adding a comment below. 20:50:23 Paul Allison: mike.solinski and william.kist await your call. 20:54:23 wkist: Sorry to hear you're having problems, Susan! 20:54:31 Paul Allison: hi Bill. 20:54:42 Paul Allison: Susan should we look for back up? 20:54:46 wkist: Hi! Where do I drag a couple links I'd like to show? 20:55:14 Paul Allison: Into the box where you type chat. 20:55:31 Paul Allison: and you can wait until the links make sense. 20:55:45 Paul Allison: We publish this chat with the podcast. 20:55:56 Paul Allison: Welcome Wendy and Jenny. 20:56:20 Paul Allison: Susan is having technical difficulties, but we will start soon. 20:56:21 Jenny Brandon: Good evening all! 20:57:00 Paul Allison: Hi Jenny, please introduce yourself.. where you teach? 20:58:01 Jenny Brandon: Audio a problem? 20:58:02 Paul Allison: Welcome. William Kist is with us here now... and when we begin on the webcast. 20:58:11 Paul Allison: Yes, no audio yet. 20:58:56 Paul Allison: Where do you teach? 20:59:25 Wendy: Hi Paul. I have seen the book, but not read it. I teach outside Phila. in an independent school--5th grade. 21:00:02 Paul Allison: Welcome Wendy. 21:00:22 Paul Allison: Welcome Mike. 21:00:34 mike slowinski: I made it! Thanks! 21:00:50 wkist: Good to "see" you, Mike! 21:01:50 Paul Allison: We are still waiting for Susan -- who just came back online-- AND we have welcomed a 5th grade teacher, Wendy from outside of Philadelphia (snow enough?) and a 1st and 2nd grade teacher from West Tenn. And Troy Hicks. 21:02:19 Paul Allison: SusanEttenheim will be connecting the skype machine and broadcasting as soon as she can. 21:02:42 Wendy: plenty of snow here. Love it. 21:02:42 Paul Allison: William Kist and Mike Slowinski are here now, if you want to start chatting feel free. 21:03:38 mike slowinski: Yikes! Send some of that to the Olympics! 21:03:44 wkist: We are hoping so, too. My sister-in-law, who teaches hasn't had to work in 10 days! 21:03:49 Paul Allison: Susan is almost ready. 21:05:49 wkist: Hello, to Tracey! 21:05:52 Jenny Brandon: audio? crickets? 21:06:07 Paul Allison: We'll be broadcasting in just a second. 21:08:18 wkist: We're still working on the audio! 21:08:29 Paul Allison: Susn is working on it. 21:08:35 Paul Allison: Thanks for the patience. 21:08:53 SusanEttenheim: hi everyone can you hear us? 21:09:17 SusanEttenheim: are you on edtechtalk A? 21:09:54 Paul Allison: Susan is fixing the problem! 21:10:31 Paul Allison: We will begin in one minute. 21:10:36 Jenny Brandon: shall I give you a topic? 21:10:45 Paul Allison: Who has seen William's bok? 21:11:34 mtlehr5: lol...I remember those days! 21:12:09 Wendy: I have a 7 yr old who threw up down the stairs last months. Luckily we don't have carpet there. Lovely cascade effect. 21:12:18 SusanEttenheim: can you hear us now? 21:12:51 Jenny Brandon: so, when's Stephen Colbert gonna be on the olympics? 21:13:29 Jenny Brandon: I HEAR YOU! 21:13:58 Paul Allison: Okay... Susan will be right back. We have it! 21:14:25 Paul Allison: Who here teaches in a "socially networked classrom"? 21:14:51 wkist: I try to! 21:15:10 Paul Allison: Jenny say more. 21:15:26 Paul Allison: how do they *act* that way? 21:15:29 Paul Allison: pass notes? 21:15:35 Jenny Brandon: THEY TALK TOO MUCH! 21:15:51 wkist: Good point--who needs computers for social networking? 21:16:11 Wendy: we have an active class blog, but it isn't a ning or anything. 5th graders are too young for ning. 21:17:24 Paul Allison: We're coming on now... again. 21:18:34 wkist: I've been disconnected! 21:21:04 mtlehr5: Still no audio...I'm trying everything. Sorry. 21:21:32 Jenny Brandon: well, how about a little social networking via chat? 21:22:51 mtlehr5: Was that a pun, Bill? 21:23:01 wkist: What's a "pun?" 21:23:22 wkist: I'll look it up later. 21:23:26 mtlehr5: Did I spell it wrong? 21:23:48 Jenny Brandon: I had pancakes for breakfast. They were waffle. 21:24:05 Jenny Brandon: should I be hearing something yet? 21:25:09 mtlehr5: lol...yes you do. Things tend to get lost in translation with text. 21:25:52 Wendy: big olympics skiing crash, fyi. 21:26:39 SusanEttenheim: haha it's a 2 computer night! 21:26:46 Wendy: should I hear anything? 21:28:06 mslaneeus: No sound here. 21:28:30 SusanEttenheim: can you hear now? 21:29:30 SusanEttenheim: could you hear me too? 21:30:54 SusanEttenheim: can you hear us now? 21:31:48 SusanEttenheim: how is the sound everyone? 21:31:54 mslaneeus: Fine for me. 21:31:59 wkist: Great on my end! 21:33:19 SusanEttenheim: what makes you say that? 21:33:31 SusanEttenheim: can you hear? 21:33:55 SusanEttenheim: what platform are you on? 21:34:29 mtlehr5: I have sound! 21:35:43 SusanEttenheim: if only it were that simple! 21:35:59 SusanEttenheim: ok so on to the book! who has seen it? 21:36:00 wkist: We're talking about how Mike and I began collaborating on a Facebook project. Can anyone hear us? 21:36:25 SusanEttenheim: oh dear william.. a little faith please! 21:36:36 wkist: Great! Sorry, just wanted to make sure! 21:36:45 hickstro: Glad to be able to hear you! 21:36:55 wkist: Wish we could hear you guys! 21:36:57 Joel Malley: I wonder what the advantages are of using Facebook instead of something like Ning. 21:37:11 SusanEttenheim: william - did you see that question? 21:37:19 Wendy: I wanted to use a ning in my room, but 5th graders aren't old enough. 21:37:23 mtlehr5: Is Mike Canadian? 21:37:32 wkist: Yes, I would just say that it's probably just that you're giving the kids a chance to see that Facebook can be used professionally. 21:37:53 Joel Malley: @jenny, you can use FB but not Ning? 21:39:47 wkist: Mike had to do a lengthy presentation to his Board of Education and do lots of groundwork before starting this project. 21:39:48 SusanEttenheim: we skipped introductions tonight! Could you all please type in where and what you teach? 21:40:10 wkist: I use it professionally! 21:40:20 Joel Malley: do you have two accounts William? 21:40:24 wkist: I think a lot of academics do, and lots of people in showbiz, as you point out. 21:40:27 hickstro: I am curious to know how students respond to teachers using FB for educational purposes... do they feel as if you are co-opting their social space? 21:40:55 Wendy: 5th grade teacher outside snow-bound Phila. 21:41:00 wkist: Unfortunately, I didn't realize this until I was into Facebook so deeply and had mixed all my personal contacts with my professional contacts. I wish now that I had learned about setting up two profiles! 21:41:02 SusanEttenheim: thanks wendy welcome! 21:41:32 wkist: Good question, Troy. This was a "problem" that we did encounter that I hope we'll talk about. 21:41:49 SusanEttenheim: carol - where and what do you teach? 21:42:37 SusanEttenheim: are any of you using facebook in your classes? 21:42:56 mslaneeus: I haven't tried but I am willing to. 21:43:06 hickstro: @wkist -- interesting. I look forward to hearing more on your thoughts about mixing these personal and academic personas. 21:43:07 mslaneeus: Filters can be lifted by school here. 21:43:46 Joel Malley: What constitutes a post? 21:44:13 SusanEttenheim: jenny - what and where do you teach? 21:44:55 SusanEttenheim: that's right - wow high school is a long way off! 21:45:33 Wendy: @Jenny I had parents sending requests too. Parents who I just can not say I know more than name. 21:46:29 Wendy: isn't it always the "interesting ones" who want to be fb friends? 21:47:01 jennyb: How is that working for you Mike? 21:47:09 SusanEttenheim: don't you think the personal and professional will overlap eventually anyway? 21:47:18 jennyb: I got on FB to spy on my own children! 21:48:17 SusanEttenheim: jenny - how can you do that unless you friend them? 21:49:36 mike slowinski: Uhoh, can't hear? 21:50:37 SusanEttenheim: sound ok again right? 21:50:53 SusanEttenheim: wow broadcasting in the country is so different from the city! 21:51:11 jennyb: OHHHH. Your students have a "professional page"
21:51:35 wkist: I also don't friend students until after they graduate. Mtlehr5 is one of my former students! 21:51:44 SusanEttenheim: don't you think eventually there will just be more and more ways to send out some things to some people? 21:52:33 SusanEttenheim: I'm wondering how the professional pages are named? user names? 21:53:43 Wendy: Mike, are your pages linked when you sign in? 21:56:47 SusanEttenheim: you should have sound now, right? 21:57:11 Wendy: if this is their prof. page, shouldn't it have their name so that it is the beginning of a resume? 21:58:14 hickstro: From a technical standpoint, do you feel that FB functions in a manner that allow students to communicate effectively? 21:58:24 Wendy: but these kids all have fb accounts with their names anyway. Of course not in crazy divorce situations. 21:58:44 hickstro: For instance, is the discussion forum feature in FB as good, better, or just different from Blackboard, Ning, Nicenet, etc? 21:59:34 hickstro: Also, are they able to effectively able to embed and comment on multimedia? Both content that they find to share as well as content they create? Again, are the commenting and discussion tools robust enough for students to engage in substantive conversation? 21:59:34 Wendy: What about ning as a tool. Might not be not allowed at home, has a more academic look and lots of content sites to show? 22:00:10 mtlehr5: My underage children may only have facebook accounts if I also have their password. I check their pages regularly. This is a workable solution for many parents. 22:00:25 hickstro: Also -- curious -- do their "habits" from their own personal uses of FB carry over into these academic discussions? For instance, do they use txt speak? 22:00:37 hickstro: Is that encouraged or discouraged? 22:01:08 Wendy: I don't let my 5th graders use txt speak on our blog. We talk about how the audience is different than for texting. 22:01:25 hickstro: Cool, multimedia book projects! 22:03:10 wkist: None of these venues/forms can do it all. 22:03:50 hickstro: @wkist Good point. Given that they are familiar with FB, that does bring down one of the barriers to entry, and that is a good reason to use it. 22:03:50 Wendy: Still wondering what others think about a nign vs fb? 22:04:47 SusanEttenheim: troy - are you on now? 22:05:18 Joel Malley: Then again, I don't think that Facebook archives all of users content...like I can't go back and see my status updates from a month ago, right? 22:05:49 Wendy: @joel, good point. 22:09:59 SusanEttenheim: but jenny imagine having done this 5 years ago! 22:10:18 jennyb: I was on dial-up 5 years ago - nightmare! 22:11:00 hickstro: @wkist -- "the new media is forcing us to do things that we should have done years ago"
22:11:52 hickstro: @wkist -- "we are a discipline that is more process-oriented" ... "new media plays right into that"
22:12:27 hickstro: I wonder how we help our colleagues move from this idea of being "content experts" and into "process experts"
22:12:46 wkist: Yes, that is the rub! 22:13:44 Joel Malley: what jobs revolve around social networking? 22:14:28 SusanEttenheim: haha 9 months after the snow there will be babies and x number of new facebook accounts! 22:14:52 SusanEttenheim: yes for sure! 22:16:10 wkist: The audio is cutting in and out for me. 22:16:31 SusanEttenheim: william go ahead and speak now..
22:16:47 wkist: I'm trying to talk. 22:17:19 hickstro: Just wondering the extent to which English teachers need the "traditional" courses in literature and composition to frame their background, give them the depth they need to be able to offer the wisdom of the discipline to students. 22:17:57 SusanEttenheim: things break using technology but there were many more people I missed meeting before cellphones! 22:18:16 hickstro: Then, to what extent do they need to understand aspects of new media composition and how to help their students comsume and produce multimedia texts. 22:19:47 hickstro: Thanks, all! Great show, despite the difficulties. 22:20:00 hickstro: Thanks, Bill and Mike for sharing your work in the book, and on the show! 22:20:01 wkist: Thanks so much for what you're saying, Paul, about my work. You're also helping to build the canon! 22:20:07 jennyb: been great, skippy, but great! 22:20:16 mike slowinski: Thanks and good night! 22:20:22 wkist: It's been a pleasure talking with all of you! 22:20:30 mtlehr5: In spite of the difficulties...this was very interesting discussion! 22:20:36 SusanEttenheim: night everyone! thanks!